The Royals seem to always find a way to win, and it was no different in Game 1 of the ALDS. Mike Moustakas hit a go ahead home run in the top of the 11th to give Kansas City the 3-2 lead, which would be the final score. The Royals where last in baseball in home runs in the regular season with 95, they where the only team to not hit 100, so it’s only fitting they won this game on a home run. The Royals have played in the two most exciting games of the postseason so far, the other two games have been blow outs. The only two runs that Los Angeles had came off of home runs by Chris Iannetta and David Freese. The Angels finished the game with just four hits. They had one of the best offenses during the regular season. Jared Weaver went seven innings for the Angels and gave up two runs on three hits. Kansas City went 5 1/3 innings without a hit, before Moustakas came through his home run. 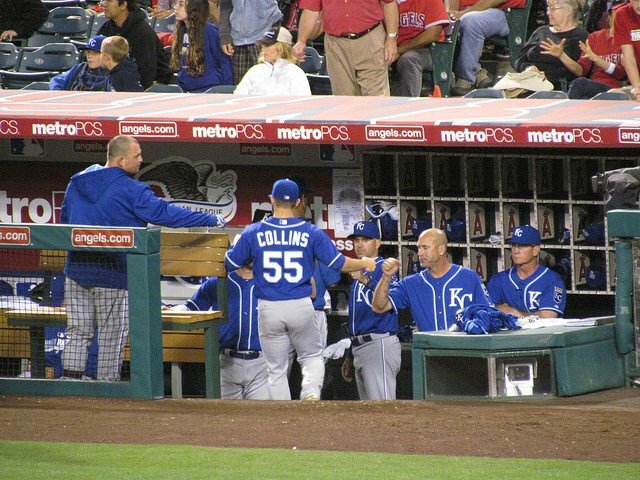 Kansas City scored first in the third inning on an Alcides Escobar double that drove in Moustakas. The Angels followed in the bottom half of the inning with a run of their own, when Iannetta homered. The Royals finished the game with just four hits. If there had to be a player of the game it would go to Mike Moustakas. He went 1-3, drawing a walk, and scoring two runs. Jason Vargas went six innings and gave up two runs. 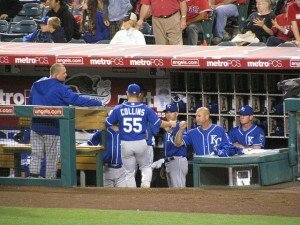 I was surprised by Vargas performance, I though this would be one of the games that Kansas City would lose. The Royals only had one stolen base, which is far from their seven on Tuesday. Game 2 is tomorrow at 9;37 p.m. ET on TBS. Rookie pitchers will square off with Yordano Ventura (14-10) going for the Royals, and Matt Shoemaker (16-4) for the Angels.